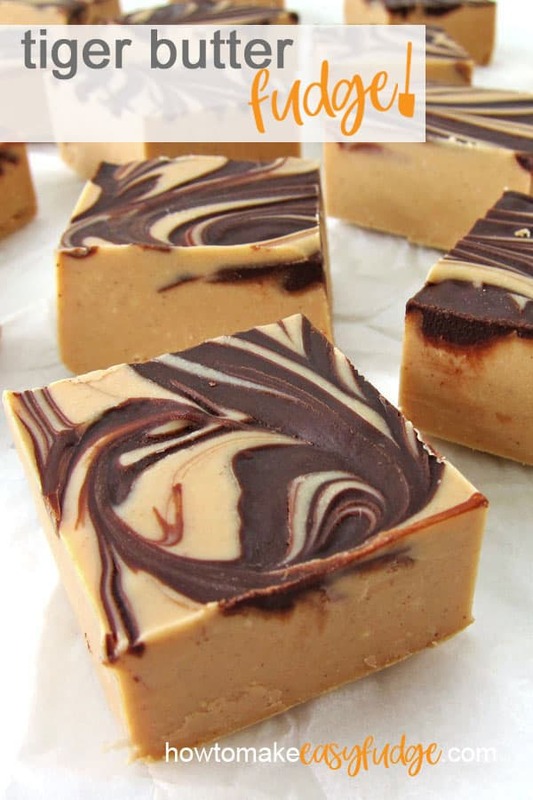 Top a layer of wildly amazing peanut butter fudge with a swirl of decadent chocolate ganache to make this Tiger Butter Fudge. It’s easy to make in the microwave and it looks as grrreat as it tastes! 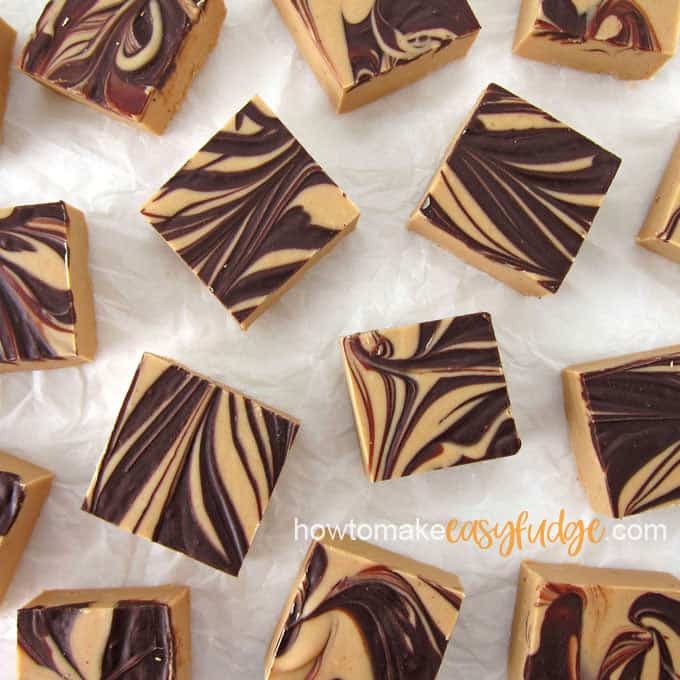 How fun is this homemade tiger butter fudge? The stripes of dark brown chocolate ganache through the tan peanut butter fudge layer are so visually appealing that this treat is hard to resist. You’ll want to claw your way to the candy dish so you can sink your teeth into this decadently creamy fudge. 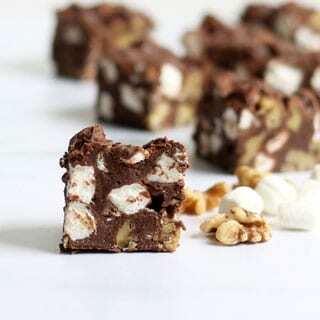 This tiger butter fudge is easy to make in the microwave or on the stove-top using 6 ingredients including white chocolate chips, peanut butter chips, creamy peanut butter, salt, chocolate, and heavy whipping cream. This easy fudge has a thin layer of chocolate on top. 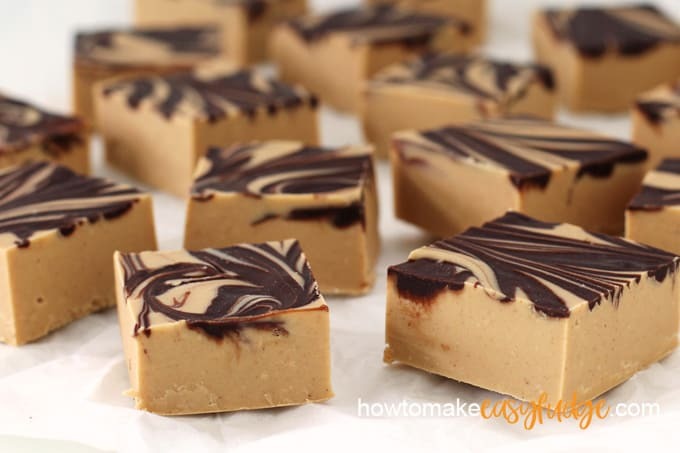 If you’d prefer fudge without chocolate check out my recipe for Peanut Butter Fudge or if you want even more chocolate swirled on top then look at the Chocolate Peanut Butter Fudge recipe. Melt the white and peanut butter chips together. You can melt in the microwave or in a double boiler on the stove. Stir in the peanut butter and salt then pour it into an 8 inch square pan that has been lined with parchment paper or non-stick tin foil. Lining the pan makes for easy removal of the fudge once it’s set. 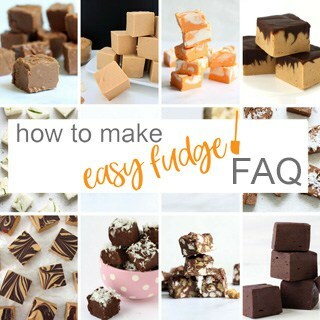 For more details check out the How To Make Easy Fudge FAQ page. Stir the chocolate and heavy whipping cream together and melt in the microwave. Stir until melted then drizzle over the peanut butter fudge and swirl with a knife. You want the stripes to be a reminiscent of tiger stripes. Don’t over-swirl the chocolate into the peanut butter fudge as it will get muddy looking. Cover the fudge and set it aside at room temperature for 8 hours (or overnight) and prepare yourself to enjoy the most amazing tiger butter fudge you will ever try. Why is this fudge made using white chocolate chips and peanut butter chips? 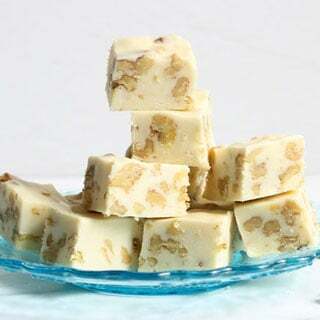 White chocolate chips adds a sweet vanilla flavor and creamy smooth texture to this fudge. The peanut butter chips add a wonderful nutty flavor. Why not just use peanut butter chips to make tiger butter fudge? Peanut butter chips tend to be a bit dry and a little chalky in texture and will make a much drier fudge if used by themselves. The white chocolate not only adds a lovely creamy texture it also adds a sweet vanilla flavor to the fudge. What type of white chocolate chips should I use to make homemade tiger butter fudge? I like to use Nestle’s Premier White Morsels or Peters Ice Caps to make this creamy fudge. These products are both actually confectionery coating. Unlike pure white chocolate which has cocoa butter listed in the ingredients, these products both are made using palm kernel oil, but despite that, they work perfectly in this easy fudge recipe. What type of peanut butter chips do you use to make this homemade fudge? I use Reese’s Peanut Butter Chips but you can use any other peanut butter chips brand. They add a second layer of peanut butter flavor which really helps enhance the overall flavor of the fudge. Can I use Jif Creamy Peanut Butter to make this fudge? Yes! That’s what I use. Jif Peanut Butter tastes great! But, you can also use your favorite brand of peanut butter, if you prefer. 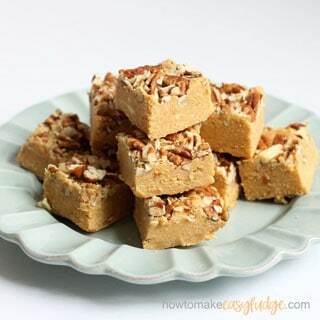 I have not made this fudge using a natural peanut butter but I’m sure it will work as long as you make sure to stir the oil into the peanut butter well before you add it to the melted white and peanut butter chips. Do I have to add salt to this fudge? No, but salt will help bring out the nutty flavor of this fudge so I do suggest using it. Can I just swirl melted chocolate into my fudge? You can, but the chocolate will harden causing the fudge to have crunchy bits of chocolate in it. The heavy whipping cream adds richness, creaminess, and softness to the chocolate tiger stripes on this fudge. There is not a lot of chocolate ganache in this homemade tiger butter fudge recipe but you do want to use a chocolate that you really like to eat straight out of the package to enhance the flavor of this swirled fudge. You can find the ingredients to make this Tiger Butter Fudge at amazon (commission earned for sales). Watch this video to see how to make this easy tiger butter fudge. Creamy peanut butter fudge topped with a swirl of chocolate ganache looks as good as it tastes! Line an 8 inch by 8 inch square baking pan with tin foil or parchment paper. Pour white and peanut butter chips into a microwave safe mixing bowl. Stir for about 20 seconds. Heat for 30 more seconds on high power. Stir in peanut butter and salt until well combined. Pour chocolate chips and heavy whipping cream into a microwave safe bowl. Heat on high power for 30 seconds. Let the bowl rest in the warm microwave for 3 minutes. Drizzle over the peanut butter fudge. Cover with tin foil and set aside for about 8 hours until the fudge is firm enough to cut. Remove fudge from pan and peel off parchment paper or tin foil. I hope you enjoy making this amazing tiger butter fudge. It is so pretty that it makes a wonderful gift but you better make two batches because this stuff is hard to resist. Before you know it you won’t have enough fudge to fill a box or tin because you’ll be sneaking pieces of it! I’ve had tiger butter bark before but had never tried the fudge until you shared it with our office staff. This fudge is to die for! We all loved it and I can’t wait to use your easy fudge recipe to make it for my family. With so many fun and easy recipes, wouldn’t it be fun to make an assortment for Christmas gifts?? Absolutely. We will be sharing some gift giving ideas in the coming months. I hope you stop back by to check them out. Tried this recipe last week…delicious! I’m so glad you enjoyed this Tiger Butter Fudge!